The town of Wakefield was evacuated at 12.50pm today, causing 3000 residents to find other accommodation. It affects between 800-900 homes. The evacuation is expected to take 4-6 hours. A medium-scale adverse event has been declared for Tasman district, unlocking $50,000 of extra funding to help speed up the recovery. Ground crews will continue to work through the night after Nelson residents were evacuated after a second fire broke out in Walters Bluff. At an official briefing from emergency services tonight, Fire and Emergency NZ incident John Sutton said so far they had managed through the day without significant growth in the fire. "If this continues on for today, it'll put us in a good situation tomorrow." Ground crews would work throughout the night, Sutton said. Deputy incident controller Grant Haywood said about 3pm an additional fire spread rapidly through Walters Bluff hill threatening six residences. The only property loss had been a deck on one of the properties, he said. The fire is located in Sir Stanley Whitehead Reserve. 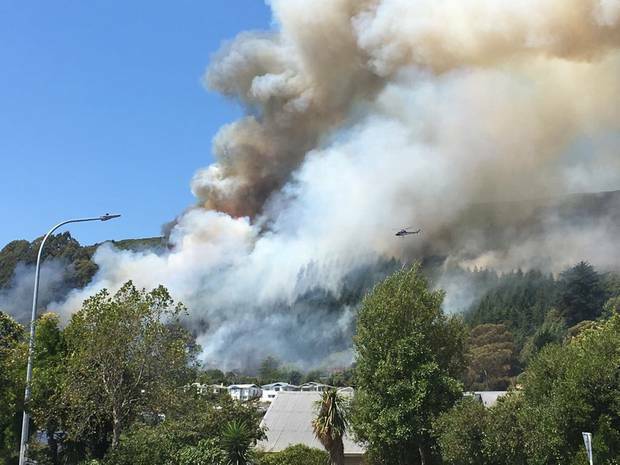 Nelson City Council posted to Facebook saying, "If you've been evacuated following the Walters Bluff fire and you need accommodation; please go to the Saxton Stadium Civil Defense Centre at Saxton Field, Main Rd Stoke." Nelson mayor Rachel Reese praised firefighting efforts calling them outstanding, fast and effective. Five helicopters are in action on the hill and nearly 30 personnel from Canterbury councils have been deployed to help respond. The following roads have been closed; Cambria St, Weka St, Atawhai Cres and Milton St.
People are also asked to avoid QEII Drive and stay away from the surrounding area. Founders Heritage Park has been closed and the NBus Atawhai service has been suspended. A witness who works nearby, who has been evacuated, says the blaze sparked up after 2.30pm. "One of the girls saw smoke and we got a call shortly afterwards to evacuate. "It's a big blaze, there are five helicopters here. "Someone lit [it], saw it take off, and me and my boy went up the hill with a bucket," he told the Nelson Weekly. Telecommunications provider Spark said a cell tower in Wakefield was in the direct path of the fire. Flame retardant had been deployed at the tower, and the company was trying to bring in a back-up cell site. That meant mobile coverage could be affected in the area while the work was carried out. Earlier the council advised people stay out of area and close windows if they smelt smoke. NZTA has also reported a serious incident on State Highway 6 between Trafalgar St and Tui Glen Rd. Multiple helicopters are battling the new blaze by extracting water from the port, which is being fanned by northerly winds. It is asking people to avoid the area or use an alternative route. A caller to Newstalk ZB named Tony said he watched the flames go up. He said the blaze took hold very quickly and was spreading across the back of houses, and said it looked like they were ready to go up in flames. Matt Armitage, who lives about 8km away from the fire, said helicopters were going back and forth to fight the fire. "They got on top of it pretty quick, but because it is so dry it is still spreading," he said. "There is a sea breeze coming through which is the last thing we need." 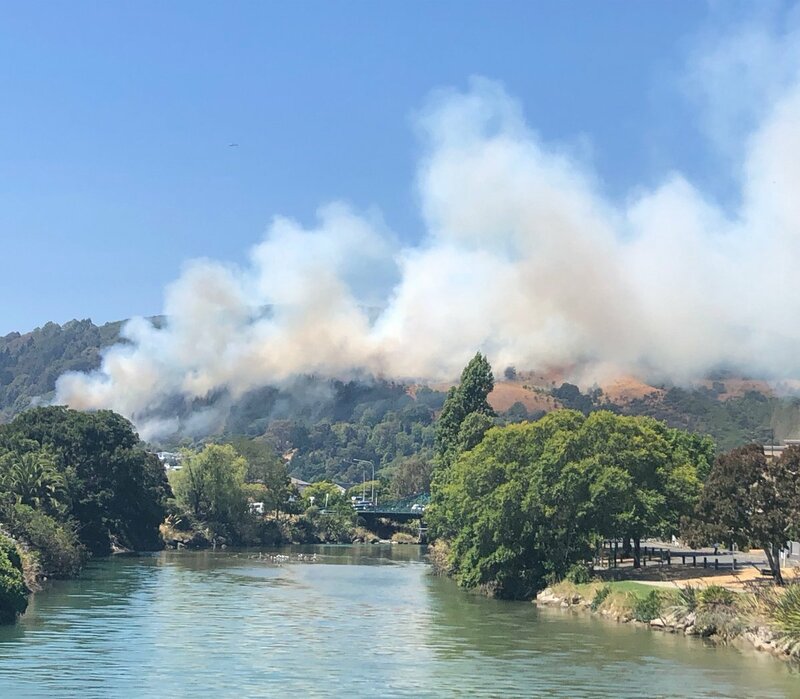 The fire located northeast of the city started just before 3pm and brings no respite for firefighters who have been tackling a large fire in Pigeon Valley near Nelson since Tuesday. 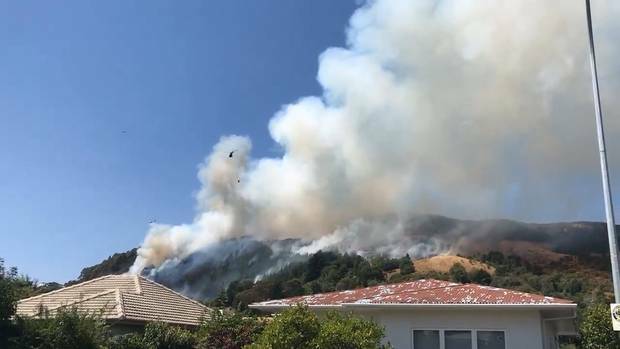 Canterbury Civil Defence and Emergency Management (CDEM) group duty officer Gavin Treadgold said as of this afternoon, it had sent an additional 22 response team volunteers to provide support to the fire response. "The response we've seen from the community, emergency services and the CDEM efforts so far is outstanding," he said. "We hope sending additional resource will help further strengthen the already great job they're doing." It is expected the deployment will last through the weekend. The Walters Bluff fire comes after the call was made earlier this afternnon to start evacuating the 3000 residents of Wakefield as a result of the Pigeon Valley fire which started on Tuesday. The Wakefield evacuations affect between 800-900 homes and is expected to take 4-6 hours. Civil Defence recovery manager Richard Kirkby said residents need to go now. There is no time to dampen down their properties, he said. Kirkby said between the State Highway and the river, the whole area is being evacuated "as we speak". "The rest of Wakefield will follow suit, they have all been told to move out, but they are focusing on that first stage and then they will be moving on to the second stage." Kirkby was encouraging residents to go and stay with family and friends. "We have opened up the Saxton Stadium and that is sufficiently big that if people need to have a place to stay that will be set aside for them to go and stay there." Residents are packing their prized belongings and some extra clothing and fleeing. Nigel Patterson, a volunteer fireman, was watering his brother's house roof before they left. Next door, a family was packing six cats and a rabbit into a car and driving 16kms away to grandparents. "We started packing our things like photo albums last night," one woman said. "We hoped we didn't have to leave but when they say go, you don't muck around." Mal Grennell and his wife Lisa Grennell were among the few waiting outside the cordon, ready to help people move stock. "It's good to be able to help, once we get through the road block," Mal Grennell said. With a stock trailer in tow, Grennell said he knew they would just be able to help people with smaller flocks. Locals were distressed about moving stock and horses, he said. "Especially the horses, they get very flighty in conditions like this." Alongside Mal Grennell, Dion McGaveston was ready help move as many animals as possible. McGaveston said he did not want to sit at home while people needed help. He has brought in two trusted farm dogs to help muster if needed. Ruth Bell, owner of Four Square Wakefield, said the whole situation was nerve-wracking for everyone. "It is unpredictable at the moment. We are still open as we haven't had the emergency services tell us otherwise," she said. "A lot of people are buying water as there is ash in the supply and it is a bit murky. "But we have a really good team in Christchurch and we have ordered some extra water so we have enough to keep our locals going." Bell said the customers had been "a bit on edge". "We are usually a relaxed country bunch but it is starting to rattle a few people now," she said.